I just wanted to say a quick RIP for my last remaining grandparent, Mary Krusiensky (Maria Borsch Krusiensky), who passed away earlier this week at the ripe old age of 90. Gram was always one of the strongest women in my life — and one of the most stylish. She was born in Lamira, Ohio in 1921, the first of four children. When she was 10, her mother died, and Gram became the de facto mother to all of her siblings. In recent years, her thoughts had turned a lot to her youth, and she would regale the grandkids with stories such as crossing the Ohio River in candlelit boats to see movies just over the state border. She met my grandfather Leo in high school, I believe, where he was a local football star — and they married, in secret, on July 4 when she was 20, and moved north to Cleveland. They had three children, and stayed married for 60+ years (he passed away in 2005). She leaves behind two twin daughters, her beloved son’s widow, six grandchildren, and one great-grandson. Gram, you will be missed. Kat – so sorry for your loss. 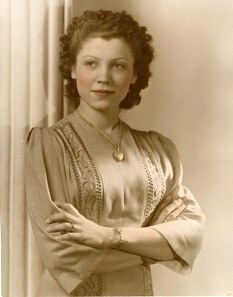 Your post brought tears to my eyes because it reminded me of my Grandma, who died two years ago at the age of 92 (in Lakewood, OH!). I bet if your Gram knew my Grandma, they would have been friends. Ditto. I’m sorry, Kat. She sounds wonderful. My grandmother was a working Ohio-woman as well. She raised my father and his two siblings essentially on her own, after her husband passed when my father was only eight. She also loved a good colored pant suit and NEVER, EVER missed a hair appointment. She died many years ago. But I miss her still and I’ll think of her today too. That is sweet. She sounds like a strong lady. Sorry you lost her. Sorry to hear about your Gram. She sounds great. So sorry for your loss, Kat. Your grandma sounds like a wonderful woman, and I think we can all see how she influenced you. My condolences to you on the loss of your grandmother. My condolences to you, Kat. Kat, I’m sorry for your loss. That was a lovely tribute to your grandmother. So sorry for your loss, Kat. What a sweet tribute to someone very special in your life. She looks so elegant and chic in that picture of her as a young woman. Hugs. So sorry. I see a strong resemblance between you and the photo. Beautiful! Kat, so sorry for your loss. I lost 3 grandparents last year – and with each one, somehow felt that they were closer than ever afterwards. I still hear their voices in my head every now and then and think of them often. I do believe that the love and influence of a grandparent lives on in their children and grandchildren long after their person has gone. I hope that presence brings you some comfort. so sorry for your loss. your grandmother sounds like an absolutely wonderful person, and that picture – clearly beautiful as well. Kat, I’m so sorry for your loss. So sorry for your loss. Your Grandmother sounds very similar to my own, down to the red hair and gold jewelry. Once my mother was on vacation with my grandma when my grandma was in her 70’s and the hotel fire alarm went off. My grandma refused to leave the room until she had her bright red lipstick on, was dressed properly and had taken the curlers out of her hair! I sure do miss that crazy lady. Kat, I’m sorry to hear about your loss, but so glad you had many good years and memories of your grandmother. She sounds like an amazing woman: fashionable, strong and devoted. While we’re talking about grandmothers, mine would have been friends with yours, had they known each other. She was a working woman, too, in small town Indiana. After my no-good grandfather left her for another woman, she raised two boys on her own. She was the best cook, and one of the strongest and kindest people I have ever had the pleasure of knowing. I’m so sorry for your loss. Is that your son in the second photo with her? So sweet. So sorry for your loss. I can see where you get some of your looks from, definitely from your grandmother. What a beautiful tribute. She seems like a special woman. Thank you for sharing this. Kat, thank you for sharing the story and the beautiful photos. From strong, beautiful women come strong, beautiful women. Hugs to you, Kat. Sorry to hear of the loss of your Grandma. Kat, I’m so sorry for your loss. She sounds like an amazing woman. So sorry for your loss. She looks so much like you in that picture! My sympathies. What a beautiful tribute for a beautiful, strong, and impressive woman. Kat – I am so sorry for your loss. Your grandmother sounds like an amazing woman. My condolences, Kat. She sounds like she was beautiful, inside and out. And I’m glad she got to see Jack. I just made my first business trip to Columbus, pretty near where your Gram was born. My favorite in-law was my husband’s grandmother, also from Ohio. Ohio ladies are strong stuff. Your Gram and my Grammy would have been very close. :). She was all suits, gold jewelry, and makeup (on her deathbed, the woman could apply lipstick no mirror). My condolences, Kat. I see a strong family resemblance, and the knack for style must also be hereditary! All my best.